Sports heroes are great marketers. Kids revere them and consequently their words may well carry far more weight than their parents' - especially when their words are crafted by Big Food marketers. I'm guessing that's what Nestlé is banking with their partnership with with the CFL and their Team Up With Nestlé 2012 campaign. So what is the campaign promoting? Carnation Instant Breakfast, sugar-sweetened milk beverages, Aero and Kit-Kat bites, Mini-Drumsticks (ice cream treats), and frozen pizza. 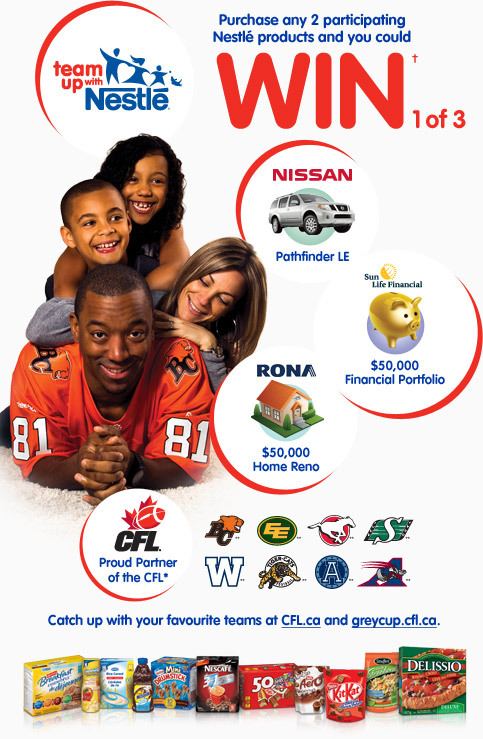 So far 3 CFL superstars have signed on - Geroy Simon, Mike McCullough and Scott Flory and in their Team Up with Nestlé commercials their families take the spotlight. You can watch all of the commercials online (for now) via this post's included inline links but only one's on YouTube and I'll embed below. 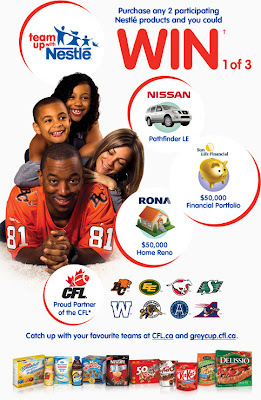 In it you can watch Geroy Simon describe how his family apparently isn't worth or doesn't bother with the maybe 10 extra minutes of time it would take to actually make a nutritious breakfast and instead they choose to serve their children Carnation Instant Breakfast - a beverage where per bottle there's 9.75 teaspoons of sugar. Then you can watch Geroy's wife grab candy bars and sugar sweetened milk boxes (with 20% more calories drop per drop than Coca-Cola and 4 teaspoons of sugar) to put in their kids' lunches for snacks while leaving the apples on the table. I wonder if the Simons know that if they give their kids a Carnation Instant Breakfast every day, in a year each would down 31 physical pounds of sugar, just under half a 5lb bag a month? Add the sugar from just the candy bar bites and the drink box and if consumed daily we're likely talking a full 5lb bag a month. In Mike McCullough's videos (Video 1, Video 2) he explains that in his home his family doesn't want to take the time to prepare actually healthful snacks and from the video it would appear that instead his family relies on candy bars, sugar-sweetened milks, instant breakfasts and mini-drumsticks. In Scott Flory's videos (Video 1, Video 2) his wife talks of how, "Delicio pizzas are great" and Scott adds in his kids could "eat them all the time", while his family's dinner table hosts chocolate syrup and mini-drumsticks. In a second video Scott's seen to be eating a mini-drumstick while an open bag of Kit-Kat bites and a bottle of chocolate syrup sit in front of him. So CFL stars are basically teaching Canadians that taking the time to actually cook healthful foods is a waste, that kids aren't worth the effort of cooking, and that junk food is in fact a regular healthful snack. In so doing the stars are also revealing that either they are too dense to know that sugary, highly processed foods aren't foods they should be regularly feeding their families, or that they're so greedy for sponsorship dollars that they'll happily abuse the trust their celebrity status affords them. Wanna See What We're Giving Out for Halloween? You Need This Stupid Thing!